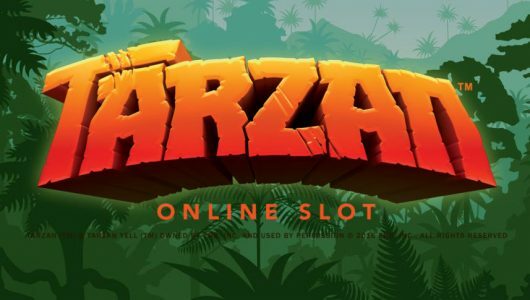 Developed and powered by Realtime Gaming (RTG), Diamond Dozen is a 5-reel, 20 payline video slot featuring a wild substitute symbol, scatter wins, multipliers, a free spins feature, bonus prizes and a progressive slot set in a romanced-theme video slot. 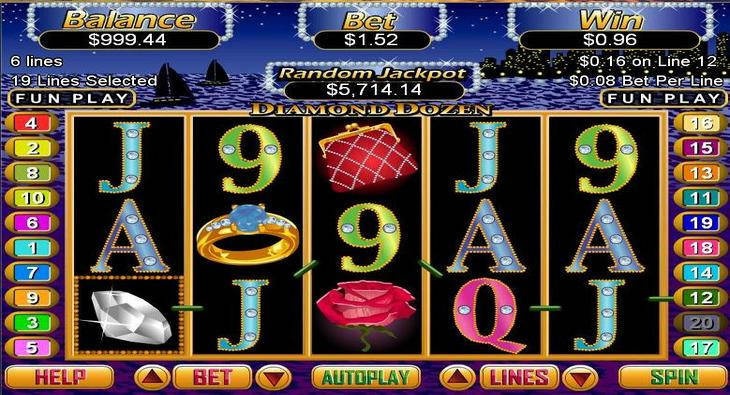 The Diamond Dozen symbols of this video slot consists of the White Diamond (wild symbol), Blue Diamond (scatter symbol), Man, Woman, Diamond Ring, Rose, Change Purse and Ace, King, Queen, Jack, Ten and Nine symbols. To play this game for real money of free visit one of the best rated casinos above in the where to play section. 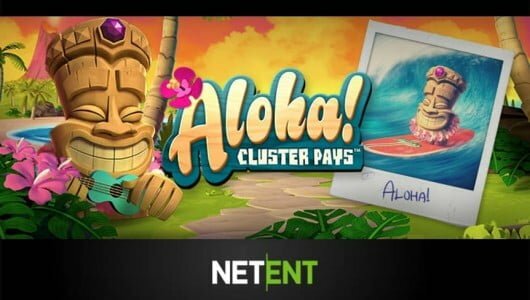 Bets on this video slot range from $0.01 to $0.10, $0.25, $0.50, $1.00, $2.50 and $5.00 per line with the ability to select from anywhere from 1-20 paylines on a spin. 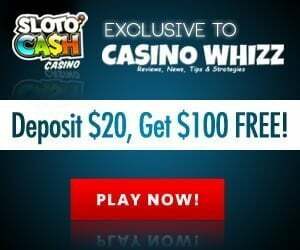 These paylines will allow you to bet anywhere from a penny up to $100.00 per spin which will give you the comfort of a wide range of betting options. There is a “Stop” button function which will allow you to skill stop the reels in the middle of a spin with a simple press. And when ready to play, just select your bet and press the “Spin” button. Let’s talk payouts with Diamond Dozen where the highest paying symbol is the White Diamond symbol where five of these on a selected payline will win you the 3,000 coin top jackpot. As expected, the White Diamond symbol is your wild and will substitute for all symbols except for the scatter symbol which is the Blue Diamond. But there is more to be won with Diamond Dozen as other paying symbols include the Man (2000 coins) and Woman (1000 coins) symbols. As mentioned, the Blue Diamond is your scatter symbol where 2, 3, 4 or 5 Scattered Blue Diamonds will pay out from 2x, 3x, 10x or 100x your bet. The Diamond Delight feature of this game is triggered when three or more White Diamonds appear anywhere on the reels. When this occurs, touch each White Diamond to reveal a number of 1 to 10 which will then be multiplied by each other along with triggering the bet to award a bonus prize. 12 Free Spins with a 2x multiplier will be awarded when three of more Scattered Blue Diamonds appear from left to right; prizes are doubled and more White and Blue Diamond symbols are added to the reels during the free spins feature. During free spins feature, the Diamond Delight feature and free spins can be yours for the taking. 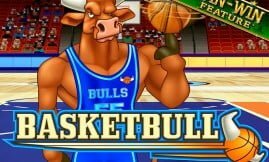 The free spins feature are played at the lines and bet of the triggering game. The Progressive Jackpot of Diamond Dozen video slot can be won on any spin of the slot game and is random. And with other wins, the Progressive Jackpot is added. 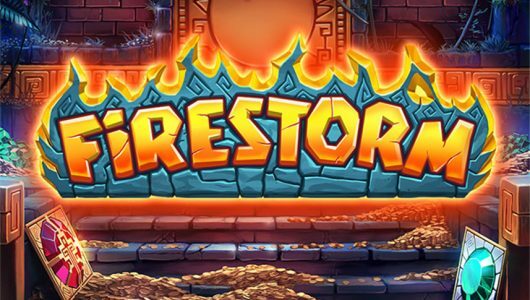 No more than a 1.5 % of total Return to Player is contributed by the Random Jackpot. Including Scattered Blue Diamonds, all symbols pay left to right with wins on different paylines added. Payline wins are added with Scatter wins and multiplied by the total bet. All payline wins are multiplied by the bet per line with the highest win selected on each payline only. A 50,000 bet per line is the maximum win paid per spin. For advanced autoplay settings, simply hit the “Autoplay” button to open up this feature where you will be able to set the number of spins, set it to stop when a jackpot is won and can be set to stop when a win exceeds or equals any amount you input. This advanced mode can also be programmed to stop on any win, stop if your balance increases/decreases by any amount that is input and stop once the feature is triggered. To deactivate autoplay mode, use the “Stop Auto” button. 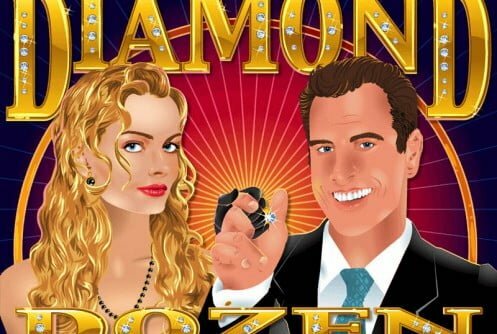 Romantic in its own way, Diamond Dozen is a game worth playing as it brings not only some nice features but also some good payouts and of course a great progressive jackpot.